It is raining in liters today. Finally monsoon has arrived !! In such drizzling rains, I would want to have a cup of hot coffee and sit by the window, let the mists of water wet my face and write, work on my on going project. And once I need a break sit and read my unfinished book on the gallery swing ( i mean books!) or may be take a walk. But that was not the case. All the unfinished books were lying in every corner of my home. Due to the rain me and son stayed home the whole day. We cancelled all of our plans. The other day, my son and his grandfather had a rather hilarious fight. 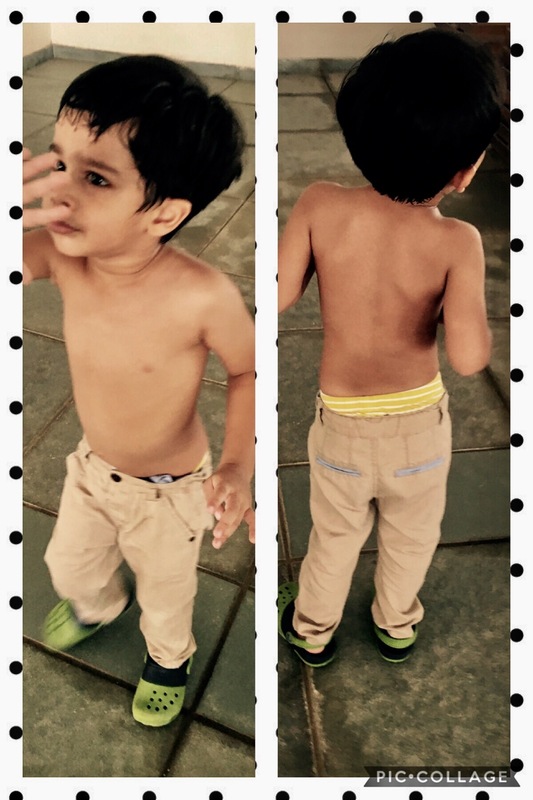 The younger one refused to wear his shirt as he announced it is too hot – “I don’t want to wear my shirt” and grand father was adamant that he cannot come shirtless. Junior explained, “oh I will wear once we reach your office .” And senior demanding him to wear it now. No one was willing to listen to me so I decided to leave the matter for them to negotiate. I was imagining a comedy version of kal aaj aur kal was being acted in our home as well. So as no activity to keep my active boy occupied, I had no option but to stay at home amd enjoy the rains. We opened the windows and let the apartment fill with the winds and sounds of the fresh showers. “Of course” and then more than an hour we watched all his favourite cartoons. Its was quite fun to become a kid with him. Boredom gives birth to creativity so after that we made alphabets with his dominoes and drew symbols of cars from his car magazines which are treated like text books by my car crazy son. After all this the rains were still drizzling happily outside. It was almost lunch time and my son face brights up with an idea. Before I could reason it out with him, he has worn his shoes and opened the door and on our building stairs so I have no choice left but to join him. Before I could argue anything he had gone up got my face napkin and tumbler and soon he was scrubbing my car with it.. If that was not enough, he cleaned allthe neighbours cars. As my son was eating his lunch I realised there is still half a day to kill. So I cooked many things by being in and out of the kitchen while playing with my son. Once papa took over I could relax a bit. My son slept early so now I get my golden time to my self. My husband had no choice but keep on fidgeting with his mobile. As the movie got over, I clapped and applauded in my living room. Its an epic movie! The Joker has raised the bar for villans so high, I don’t think anyone has been able to match up. Well, enough is written about this epic movie for an amature blogger to write more. In this wet weather hot sizzling curries goes very well with roti. 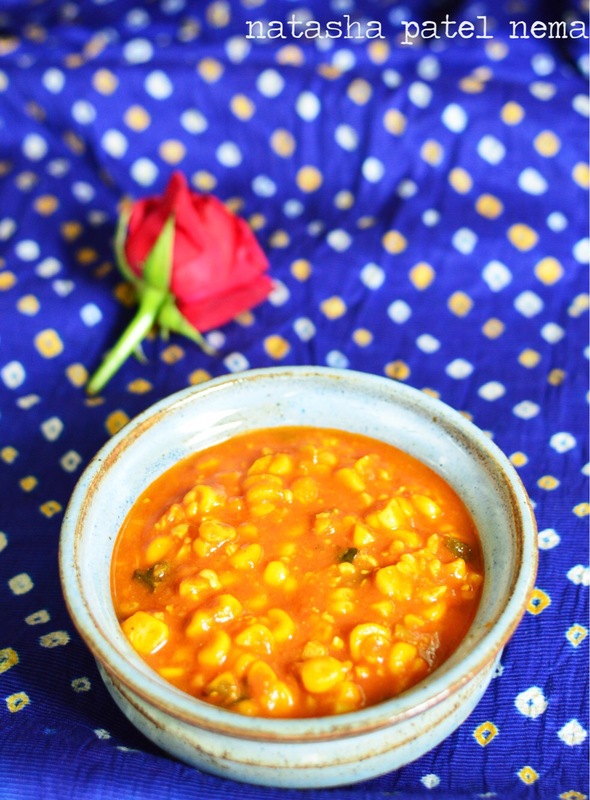 So I m sharing a recipe of a simple corn curry which goes very well with paratha, rice and roti. In a non stick pan heat the oil. Add the mustard, cumin seeds and asafoetida. Once the seeds crackle add the gram flour. Keep on stirring this and cook on low flame for 2-3 mins till the gram flour is cooked. Add the red chili powder, turmeric, green chilies and cook for few seconds. Add the tomato puree, gram masala, crushed peanuts, corn kennel. Finally add salt and coriander. Cook for 5-7 minutes and serve hot.